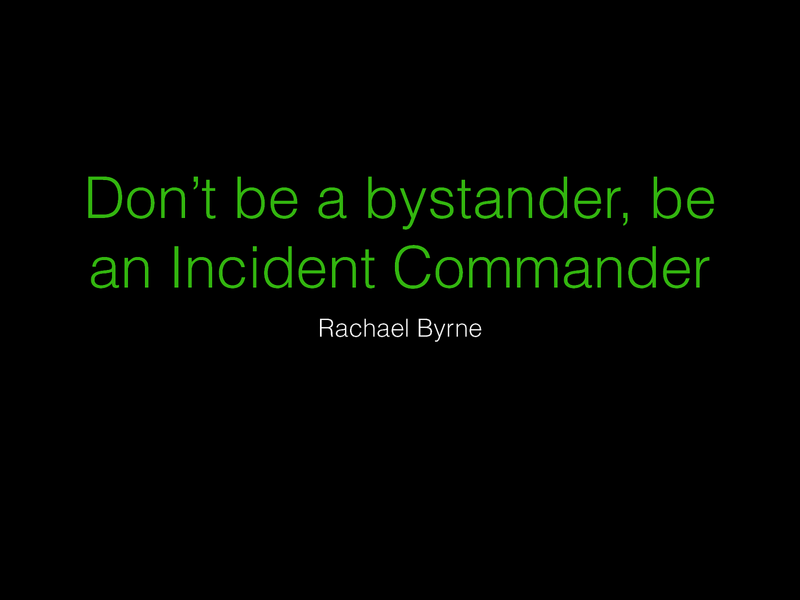 View Don't Be a Bystander, Be an Incident Commander (Ignite) on Notist. Many organizations have some kind of incident response process to coordinate during a major service outage. Some operationally mature companies incorporate a formal Incident Commander role in their process for a faster, more effective response. The Incident Commander serves as the final decision-maker during a major incident, delegating tasks and listening to input from subject matter experts in order to bring the incident to resolution. Whether or not a company has a formal process that includes an Incident Commander, most companies believe that your most senior engineer is best suited to lead an incident response. I challenge this assumption. I have learned first hand that you do not need to be highly technical, let alone senior, to effectively lead a coordinated response to a major incident. Comfort with a structured process and soft skills such as communication are actually more important than technical knowledge for an effective Incident Commander. All organizations need to maximize the number of people able to lead a major incident response to avoid burn-out of their most senior technical leaders and increase overall availability of their service. Audience members will learn from this talk how to develop an inclusive incident response process that welcomes more Incident Commanders without compromising response effectiveness that they can immediately apply at their own organizations. Rachael puts presentations on for free. You can too.